Leaks after Roux-en-Y gastric bypass are a major cause of mortality. This study attempts to define the relationship between the leak site, time from surgery to detection, and outcome. Retrospective review of 3,828 gastric bypass procedures. Of the leaks (3.9% overall), 60/2,337 (2.6%) occurred after open gastric bypass, 57/1,080 (5.2%) after laparoscopic gastric bypass, and 33/411 (8.0%) after revisions. Overall leak-related mortality after Roux-en-Y gastric bypass was 0.6% (22/3,828). 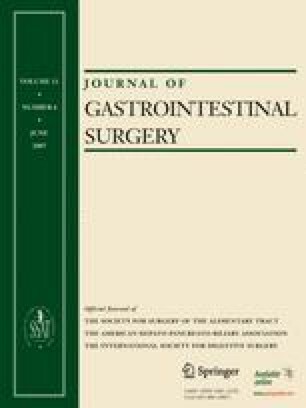 Mortality rate from gastrojejunostomy leaks (38 in the open gastric bypass, and 43 in the laparoscopic) was higher in the open group than the laparoscopic group (18.4 vs 2.3%, p = 0.015). Median time of detection for a gastrojejunostomy leak in the open group was longer than in the laparoscopic group (3 vs 1 days, Wilcoxon score p < 0.001). Jejunojejunostomy (JJ) leak was associated with a 40% mortality rate. Initial upper gastrointestinal series did not detect 9/10 jejunojejunostomy leaks. Median detection time was longer in the jejunojejunostomy leak group than the gastrojejunostomy leak group (4 vs 2 days, p = 0.037). Leak mortality and time of detection was higher after open gastric bypass than laparoscopic gastric bypass. GBP patients with normal upper gastrointestinal (UGI) studies may harbor leaks, especially at the JJ or excluded stomach. Normal UGI findings should not delay therapy if clinical signs suggest a leak. This paper was presented at The Society for Surgery of the Alimentary Tract, 47th Annual Meeting at Digestive Disease Week 2006, May 20–24, 2006, Los Angeles, California.